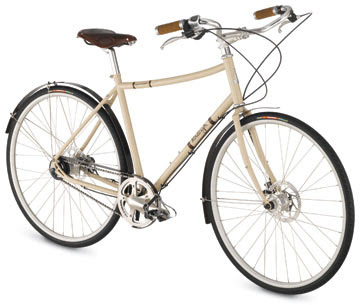 We recently special-ordered the Raleigh Superbe Roadster city/commuting bike for one of our very best customers. In an accidentally timely move, the folks at Raleigh also supplied one of the bikes to Mia, a writer/blogger for Momentum, a magazine for urban cycling culture. Mia loves the bike, saying, "It is indeed my perfect dream bike for the city, as it came fully equipped with everything I had hoped for, and more! My favorite features of my new bike include the steel cream-coloured mixte frame, the Brooks saddle and grips, the upright city-style handlebars, the internal Shimano 8-speed hub." You can read her full review here. The bike does NOT come with the Paul Components Flatbed Front Rack that is shown on Mia's bike. If you're keen on spending 200 clams for a front rack, though, we'd be happy to oblige!